That is, unless your city is Tokyo, and Godzilla can stop them. Royal de Luxe is a French performance art company whose centrepiece are enormous marionette dolls, so large they need an industrial-size frame to control and which end up scaled more on a "Stay Puft Marshmallow Man" size than a "Doll for Little Girls" size. 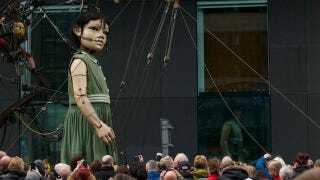 These "dolls" in particular were used over the weekend in the Sea Odyssey Giant Spectacular, a show put on in Liverpool to mark the 100th anniversary of the departure of the Titanic.